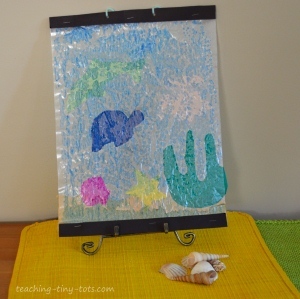 Make an ocean scene with tissue, waxed paper. Cut two pieces of waxed paper. Lay one piece on flat surface and paint with blue water color. Lay your tissue pieces onto the waxed paper. Lay the second piece of waxed paper on top. Dab excess water with a paper towel. Let dry. (Adult step) Put iron on low heat and lay dish towel on top of waxed paper. Iron until sheets of waxed paper stick together. Fold a strip of construction paper lengthwise and staple the strip on the top and bottom to form a frame. Punch two holes in the top strip and tie a piece of ribbon or yarn through the holes so you can hang your project. Have cut pieces of tissue ready to place on the water colors. Use a stencil to make the tissue shapes. Here are some fish books that would be a great way to introduce this activity or create a unit on fish or ocean.